IRHS will send its first VEX Robotics team to worlds this month. The district has made major strides in robotics in the past few years, now representing Delaware at world finals for both the VEX Robotics competition on April 25-28 (Selbyville Middle School and Indian River High School’s Indians) and the VEX IQ Challenge on April 29 through May 1 (Long Neck Elementary School, Georgetown Elementary School and Georgetown Middle School). 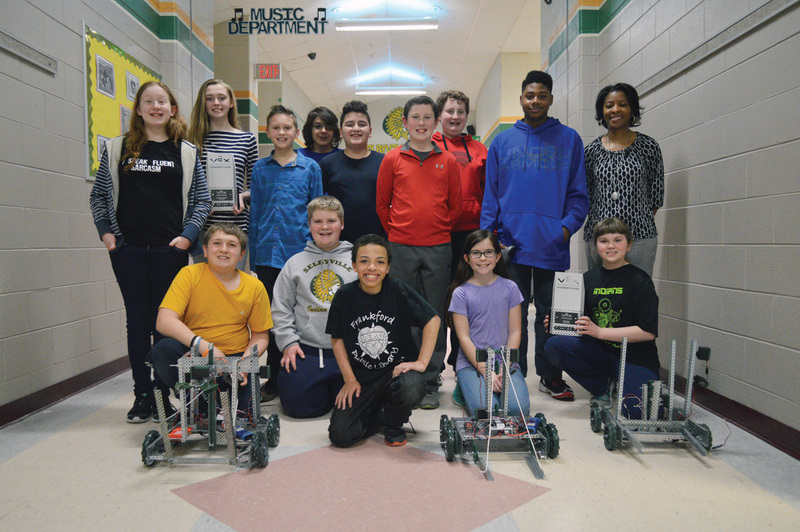 Selbyville Middle School continues a successful run by sending one of its four teams to worlds. The Rocketeers includes Kendall Coleman, Noah Coleman, Oriana Peterson and Brady Tice, coached by teacher Chelina Tirrell. Indian River High School students are participating in worlds for the first time ever, including Victoria Gee, Diego Hernandez, Madison Johnson, Logan Krick, Matthew Schmidt and Ann Weaver, coached by teacher John Milspaw. This year’s VEX challenge is called “In the Zone.” Four teams enter the 12-foot square ring, split into two alliances (“blue” and “red”). They score points by moving and stacking cones; placing mobile goals in goal zones; and by parking robots. The first 15 seconds is an autonomous round, where the best-programmed robots will shine. The next minute and 45 seconds is run by remote control. Alliances change each round, as teams compete all day long. World championships can be exciting, with activities beyond the regular competition. There are battle-bots, Lego building stations, a 3D printing station and a big unveiling of the next year’s challenge. The grand finals are shown in front of the entire crowd. Competition details, including live video of the event, will be posted online at www.roboticseducation.org/competition-teams/vex-robotics-world-championship. The SMS Rocketeers won an Excellence Award for skills overall, including competition, teamwork, interview and journal. Students included Kendall Coleman, Noah Coleman, Oriana Peterson and Brady Tice. They said they were proud that their autonomous feature worked — something not all teams even attempt. SMS Coach Chelina Tirrell said she is most impressed by her students’ resilience and grit. “Each day at practice, they engage in the engineering-design process, assuming that their ideas will work upon completion. However, quite often, the exact opposite happens, and they have to troubleshoot their design,” she said. It’s a hectic atmosphere, as all the teams basically camp out in one big room. Everyone is camped out making repairs, or running to the next match. “Sometimes, in the middle of a match, wheels fall off, something will break — so your next match is two minutes later, and you don’t have time to fix it,” Tirrell said. “Even if you are the best, you still make mistakes,” Kendall Coleman said. The SMS team isn’t making too many design changes before worlds. With a good design, they don’t want to take anything apart. “We know this is working,” Brady Tice said. “I don’t tell them how to build their robot. I don’t tell them what to do to make their robots successful. … I coach and I advise,” Tirrell said. The kids fix any problems, because they built the bot. Some had prior experience with motors and gears. Others just loved the robotics unit in school enough to continue. “Having screws and metal parts, and putting together a whole working robot that you would control with a controller … was kind of amazing,” Tice said. Teamwork is a major component, as students share responsibilities for computer programming, robot design, assembly, driving and record-keeping for the journal and research project. A second SMS team got close to worlds, as Prehistoric VEX was first place in all the qualifying rounds — until the very final match — winning second place overall. “Some of these teams have done exceptionally well all season but walked away without any kind of award,” Tirrell said. The SMS Dino Bots were also honored with a Design Award. IRHS had two small teams that are combining for a six-person team. Both subgroups had built robots rather last-minute. So when one team got a bid to Louisville, both teams combined forces to redesign the overall bot to be the best of both worlds. The students are proud of the team’s potential. “Ann is an amazing artist, so she sketches and does the notebook. Matt is a good driver … Maddie is an amazing team captain, programs it — she has all of us working. Victoria is pretty good at doing the notebook. Logan is a very overbearing co-captain. … We’ve become one!” said Hernandez, whose strength is in building and assembly. The students thanked their coach and parents for supporting them this year. “The actual design — that’s 100 percent them. They researched it online, they figured out what they need to make it,” Milspaw said. IR also won a Design Award at an earlier competition before being named Tournament Champions at the regional competition. Sending even one team to international competition is pricey, and as many school clubs know, fundraising for next year begins as soon the current competition ends. “Anything beyond [this year] goes into club funds for next year, for next year’s competition or the new cortex … the brain of the whole thing,” Milspaw said. Yes — the brain.. VEX is introducing a new computer processer that loads into the robot and receives signals from the remote control. It’ll work better, but it’ll cost more. Individuals or groups wishing to donate or help sponsor the students can write a check out to the school and write “VEX Robotics Team” in the memo line. They should also include a phone number and driver license number on the check. For more information, telephone the coaches at any of the schools.